Ever since my friend introduced me to Whole Foods’ kale salad with garlic tahini dressing, I’ve been hooked. The dressing is so addicting that it makes even a kale salad a satisfying meal in itself. Tonight I tried my own, thicker version of the dressing, and served it with sautéed carrots, cilantro, good quality olive oil, and it was even better! It would be fantastic as a side to a roast leg of lamb, or just served as something to snack on. 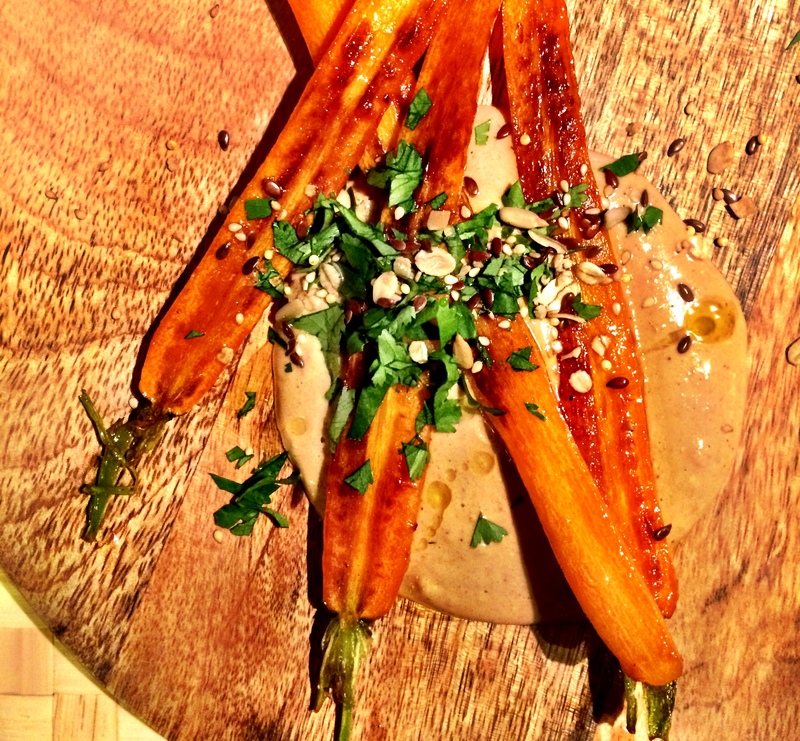 The tahini I had was very dark and rich, so I added yogurt to smooth it out and lighten the color. 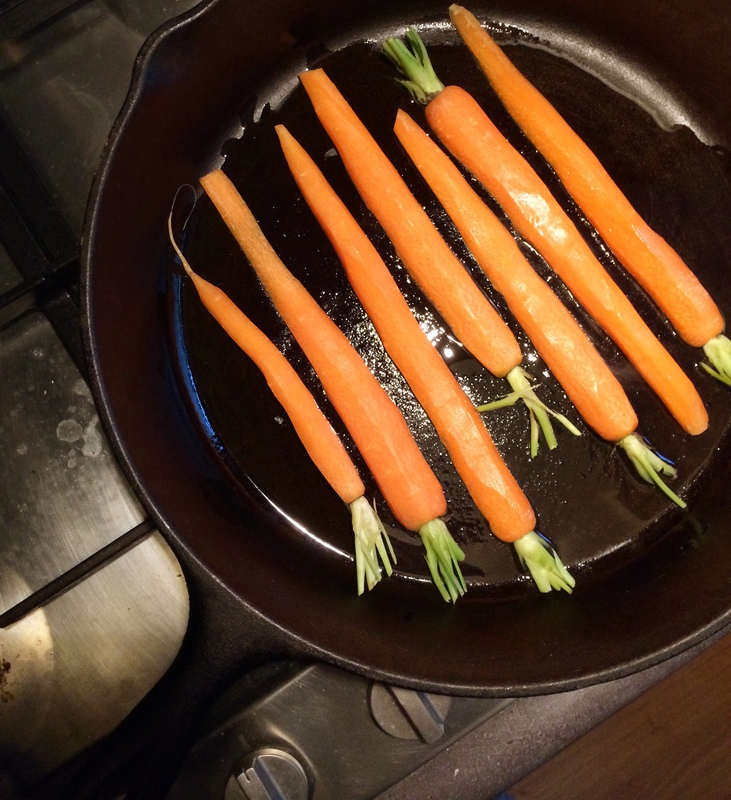 I browned the carrots in a cast iron pan over the stove, but you can also roast them in the oven. Save any leftover sauce for your own kale salad. Mince the garlic into a fine paste. Adding a dash of salt helps to break down the garlic. 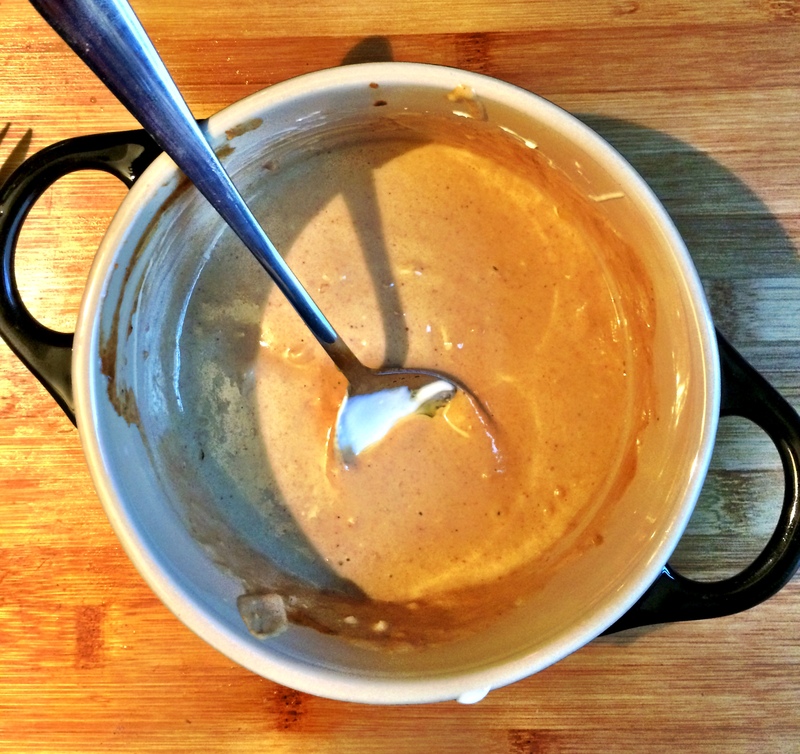 Mix together the garlic paste, tahini, soy sauce, cider vinegar, and 1/3 cup olive oil. Add the yogurt and taste as you go. The sauce can be assembled in 5 minutes. The only real work is mincing the garlic. Trim the carrot tops, but leave a little bit of the green (not necessary, but they look so cute with the green still attached). Carefully slice the carrots in half lengthwise. Heat a cast iron pan and add 1 tbsp. of olive oil. Add the carrots flat side down, and cook over medium heat for about 5 minutes, or until lightly browned. Flip and brown the other sides. Once carrots are browned, reduce heat to low and continue to cook until slightly softened. Be careful not to overcook them – they are better slightly al dente. You can also roast them in the oven with a little olive oil. Let the carrots brown a little and avoid stirring too much. To serve, spoon about 2 tbsps. of the tahini yogurt on each plate. Top with carrots, cilantro, a drizzle of olive oil, and any crunchy garnish you may have lying around in your pantry (oatmeal, flax seeds, sunflower seeds, etc).